There is plenty to do at Steele Memorial Library this month for adults! Three more fitness classes will be hosted at the library in the coming weeks. Instructors from Ultimate Fit Chick in Elmira will teach Dance Party on April 11th, Yoga on April 18th, and Piloxing on April 25th. All classes are on Saturdays from 9:30-10:30am; call 733-9173 to register. Join us during National Library Week on April 14th for an informative presentation on The Challenge of Alzheimer’s Disease in our Aging Society, presented by Dr. Mark Mapstone via videoconference at Steele Memorial Library from 5:30-6:30pm. 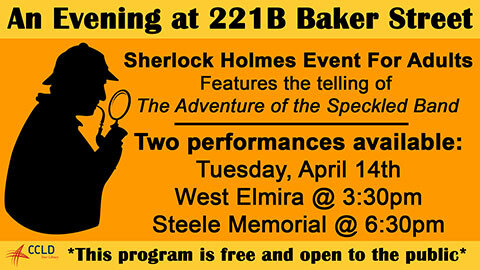 At 6:30pm on the 14th we are happy to present An Evening at 221B Baker Street, a lively mix of stories and facts on detection fiction’s most beloved literary character, Sherlock Holmes. On April 17th at 6:30pm, join us after hours for “So bad, it’s good!” Movie Night. This month we are showing MST3K’s The Pumaman (heckling encouraged!). Also during National Library Week, make sure to check something out at any of the CCLD libraries between Monday, April 13th and Saturday, April 18th, and you will be entered into a drawing to win a Kindle Fire. Later this month, we will be offering several computer classes in our Technology Training Lab: Introduction to iPad & iPhone (4/21 at 1pm), Beginning Internet (4/22 at 1pm), and Ancestry.com (4/28 at 6pm); call 733-9175 to register. We hope to see you at the library! For more information about these and other programs going on at CCLD libraries this month, check out our online events calendar: http://ccld.lib.ny.us/calendar.htm. Posted by CCLD in Programs, Steele. Question: Are you retiring or already retired; what to do? Answer: Trap pythons in Florida, or document water resources in New Mexico, guide tours at Volcanoes National Park in Hawaii, or collect environmental data in Alaska. It’s easier than you may think. 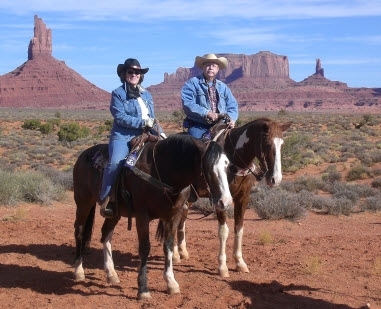 Join Merrill and Sally Frank in the Steele Memorial Library Auditorium on Wednesday, September 26, 2012 at 7:00 pm as they present how to plan a fulfilling, adventurous life after retirement. 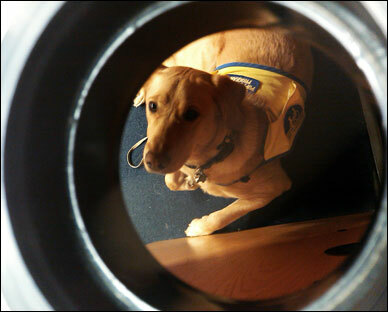 Posted by macethedog in Mace, Programs, Steele, Youth Services. It’s been a while since I have been able to write. Mom has been keeping me busy and away from the computer. I think she is afraid that I will drool on the keys. 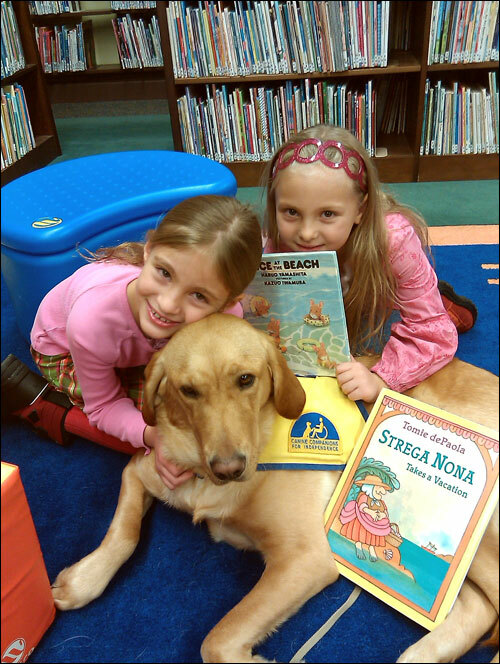 I finished my Doggy Tales program at Horseheads and am missing all of those kids reading to me, but on Thursday April 7th, you can come to the Steele Memorial Library at 3:30 and read to me. I can’t wait!!! Please!! Please come and read to me! I love to have little kids pet me and lay on me. Let’s face it, spying in the library isn’t a very busy life. I really just do a lot of sleeping in the library, but you can wake me up and ask if you can pet me. When I’m at the circulation desk, no one knows that I’m under the desk sleeping until they look into the hole where the cords go and see me under there. Usually they are surprised to see a dog in the library. But I’m a special dog!!! Mom likes to fool the kids by saying “How do you think he got down that small hole?”. Come see me on the 7th!! Posted by macethedog in Horseheads, Mace, Programs, Steele. Mace “the spy” here, reporting on what’s happening at the library. I’m a very busy dog. Besides “the spy” business, I have my own program and its called Doggy Tales. I have the cutest kids bring a book and they read to me. Come visit me at the Horseheads Free Library on Wednesday nights at 6:00 pm and read me a story! I get lots and lots of petting. All I have to do is lay there and listen. They sometimes use me as a pillow. They sure read me the best stories too. I heard all about Fly Guy. Can you imagine having a fly for a pet? I have a cat as a pet—his name is Snickers. That’s a little strange don’t you think? What kind of pets do you have? Does anyone have a fly as a pet? They read me a book called “Green Eggs and Ham”. OK who has green eggs and would you eat them? I would because I like to eat. I found out the Steele Memorial Library has a program called Toddler Story Hour for kids from 18 months old until they are 3 yrs old, on Fridays at 10:00am. Well I’m 14 months old but I look big for my age so thought I would check it out. That’s what spies do you know, sneak into places. Well, it was a lot of fun. Miss Janet read us stories and we got up and danced. OK I’m not a very good dancer but I wiggle a lot and prance around. The next time you are at the Steele Memorial Library, look for me at the circulation desk. If you ask you can pet me, I love to be petted. Sometimes I have my head under the door watching everybody leave with their books so don’t be startled.